A multimedia artist at the crossroads of history and mythology. Gallery Paule Anglim is pleased to present re-emergence, an exhibition of new work by Iranian-American artist, Ala Ebtekar. From a broad practice rich with symbolism (embracing drawing, painting, sculpture, fashion, and photography), the artist will present works on paper and paintings, including paintings on photographs, paintings on book pages, and sculptural pieces. 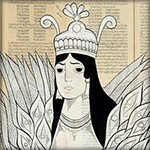 Ebtekar’s work is situated at the crossroads of history and mythology. It inhabits a realm where past and present collide in a perpetual dance of deconstructed and reconstructed time and space. Equally informed by ancient Persian epics and contemporary popular culture, by hip hop, graffiti, and comic books as well as Iranian coffeehouse painting, Ebtekar generates a visual language that expands the circle of cultural conversation. Born to Iranian parents in Berkeley, California, Ebtekar discovered fine art in his late teens after spending much of his formative years immersed in the music and imagery of hip-hop. He started deejaying at 12 years old (and went on air at age 13 on KALX Berkeley) before taking to the streets with spray paint, tagging local walls with his name in Farsi. 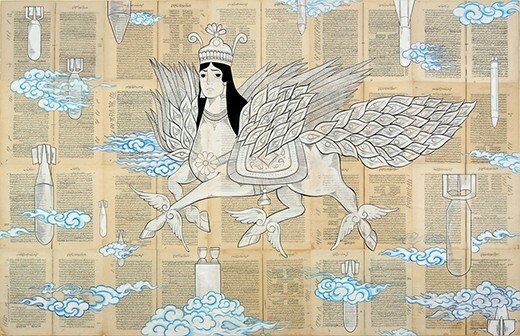 Then at 19 he moved to Tehran to study miniature painting; however, he ended up preferring the mid-20th century style of “coffeehouse painting” (qahveh khanehei)-large oils that illustrate oral narratives instead of the more highbrow classical written texts from which Persian miniatures are usually drawn. Out of these experiences Ebtekar has forged a cosmopolitan consciousness that combines the ancient and the contemporary, American and Iranian, the sacred and the commercial. 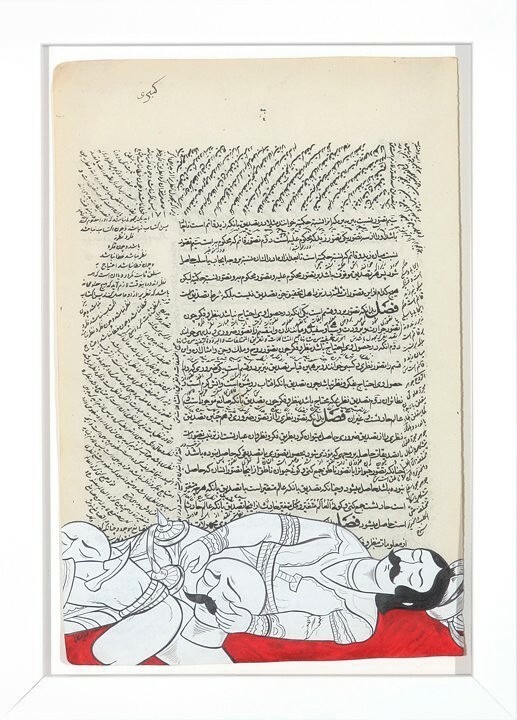 Ebtekar has shown at galleries in Dubai, London, New York, Los Angeles, and San Francisco, among others. 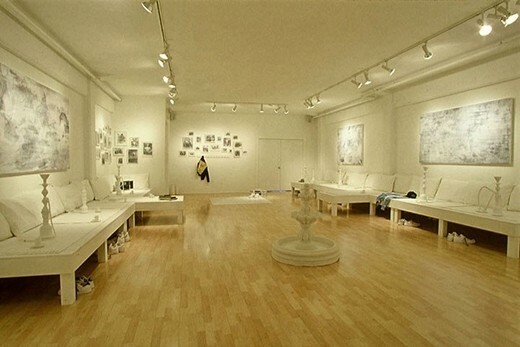 Gallery Paule Anglim previously mounted a solo show for Ebtekar in 2007. 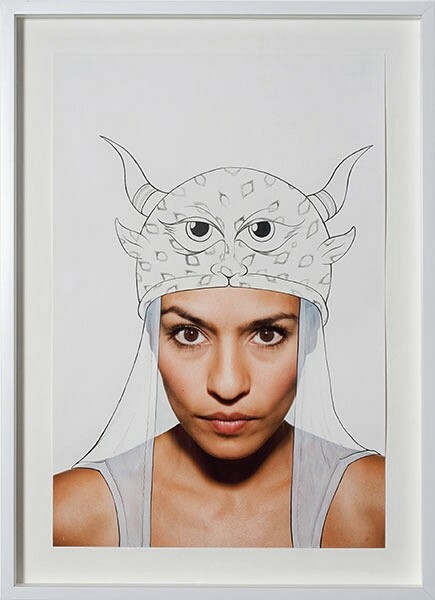 In a recent his 2009 solo exhibition in Dubai entitled, “1388,” Ebtekar featured multimedia works of Iranian women with helmets and armor painted over their hijabs, transforming them into superhero-like warriors, emanating strength, resolve, and determination. 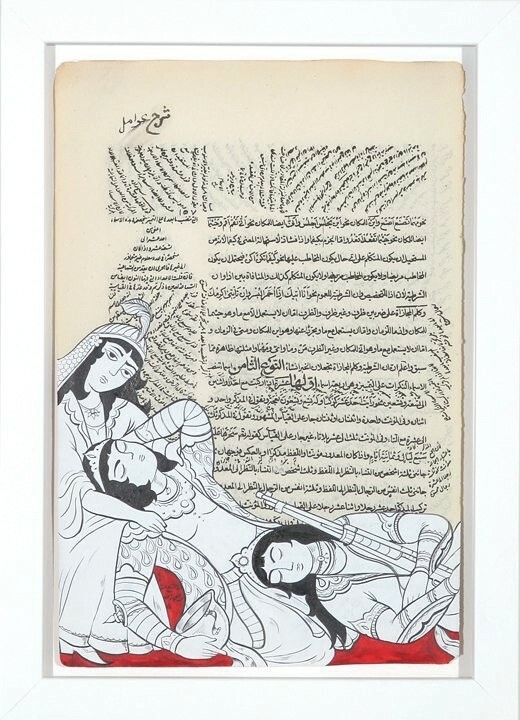 These works simultaneously hinted at ancient Persian epics and the most recent call for social justice by Iran’s youth – a movement led quite visibly by young Iranian women. Ebtekar is also well-known for an earlier series of intricate paintings on the pages of religious manuscripts, on which he situated scenes of epic battles, of warriors donning helmeted armor and wielding medieval swords and modern-day bandoleers. These works will also be on display at Gallery Paule Anglim. Indeed a theme that runs throughout Ebtekar’s work is the synthesis of past and present in ways which may occasionally jar the viewer. Born in the United States to Iranian parents, Ebtekar was raised in both Iran and the US. As a young teenager he joined the K.O.S. (Kids of Survival), working with artist Tim Rollins on collaborative artworks involving groups of urban youth. He received his BA in 2001 from the San Francisco Art Institute and in 2006 his MFA degree at Stanford. He was a 2005 recipient of the San Francisco Foundation’s Murphy & Cadogan Fellowships in the Arts Award. His work is exhibited internationally and was recently featured in two prestigious exhibitions: “One Way or Another: Asian American Art Now,” a touring exhibition originating at the Asia Society, NYC, and in the 2006 California Biennial at the Orange County Museum of Art. 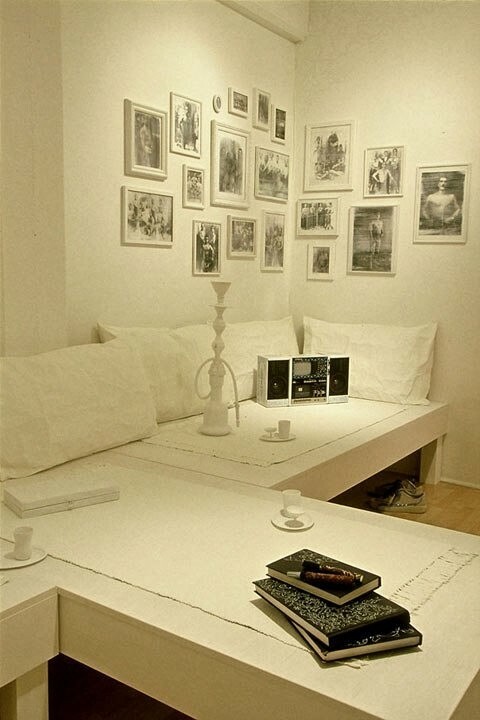 In 2007, his work was featured in a solo exhibition at Gallery Paule Anglim in San Francisco and Ebtekar participated in a six-month residency with Cité des Arts in Paris. 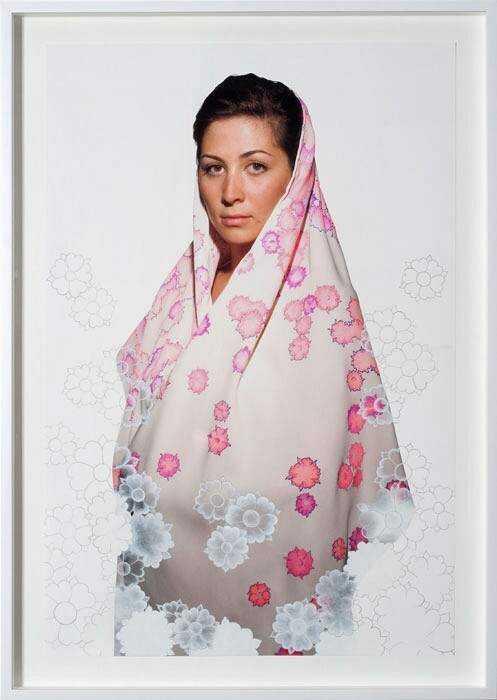 In 2008, Ebtekar was featured in Bay Area Now 5, at Yerba Buena Center for the Arts, San Francisco and in 2009 at a solo show in Dubai.